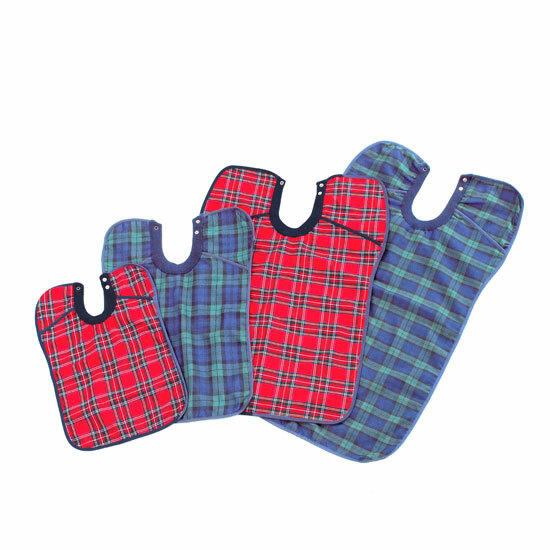 These protective bibs are in the blue tartan design. They have a waterproof lining, wide shoulder protection, a comfortable cotton neckline and 2 sizes. These protective bibs are in the blue tartan design. They have a waterproof lining, wide shoulder protection, a cotton neckline for comfort and flexibility and adjustable studs for easy neat fastening. The bibs are machine washable and may be tumble dried at low temperature. Two sizes are available - medium or large.